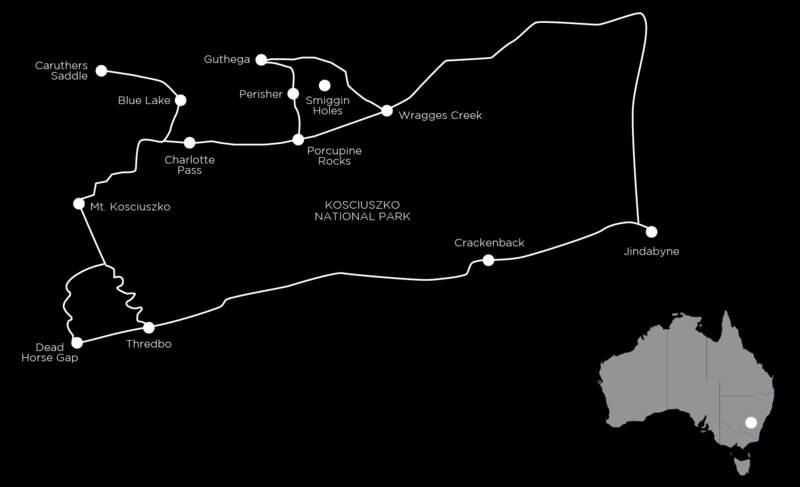 The high peaks of Kosciuszko National Park have earned it the prestigious UNESCO Biosphere Reserve status. A mecca for walkers who are keen to experience rugged scenery, beautiful wildflowers and Mount Kosciuszko, there’s a real sense of completion as you wind your way through Wragges Creek to Thredbo with spectacular views at nearly every step. Formed over millions of years of glacial, ocean and volcanic activity, this is undoubtedly one of Australia’s most breathtaking landscapes. Walk alongside rivers and undulating valleys while traversing a mix of gentle and more challenging ascents across easy mountain passes. There are some optional loops involving shorter trails leading to spectacular lookouts. Above the treeline you’ll walk to the glacially formed Blue Lake and along vast snow plains reminiscent of Middle Earth. Enjoy lunch beside pristine glacial lakes and crystal-clear creeks while listening to the clack and roll of rivers stones. Here, wildflower-carpeted meadows overlook vast valleys of the Australian Alps with the Great Dividing Range on the horizon. Hike through snow gum woodlands and colourful alpine meadows by Blue Lake. Follow the Aqueduct Trail and on the last day take the chairlift ride back to the top to walk down to Thredbo via Dead Horse Gap, capping off what is an amazing unbroken linear trek through the Alps. Start in Jindabyne any time after 2pm. There is no walking scheduled for today but if you arrive early enough you can walk for many kilometres around the shores of picturesque Lake Jindabyne. After a transfer high into the mountains, the walk begins with the easy Aqueduct Trail. Marvel at one of the greatest engineering feats in the world – the mighty Snowy Mountains Scheme built in the 1950s and 60s to change the direction of the rivers and provide water for farmers on the dry inland plains. The path meanders beside the scheme’s aqueducts, rivers and dams that opened up this isolated country. The route continues to Guthega Alpine village, set on the banks of the Snowy River. Traverse through Blue Cow alpine ski resort to Perisher Valley. Hike to Porcupine Rocks for spectacular views of the Great Dividing Range. The ancient snow gum trees here are twisted and gnarled through centuries of harsh winters. After rain or fog these tree trunks change colour to brilliant shades of red, orange, yellow and green. Even if you weren’t aware that Australia has glacial lakes, you’ll see several on this walk above the tree-line. Cross our famous Snowy River, walk through fields carpeted in wildflowers, stroll along high grassy ridges and chill your drink in icy Blue Lake. The highest peaks in the west are a striking visual treat as you walk above the treeline. To the east sub-alpine woodlands of gnarled snow gums give way to tall alpine ash, cypress pine and mountain eucalypt forests in the dry rugged areas along the lower Snowy River. Watch out for sphagnum bogs – large mossy plants that hold six times their weight in water, releasing it slowly into the alpine streams. Reaching the summit of the highest mountain in Australia, Mt Kosciuszko, is a highlight not to be missed. You’ll get to share the summit with people from all over the world. Finish the day with an exhilarating ride down the country’s longest chairlift. Hardy walkers can choose to walk Merritt’s Track steeply down through unique mountain ash forests and waterfall valleys. Take the easy way and ride the chairlift up. Today’s walk descends through fields of alpine wildflowers and snow gum forests to the Thredbo Valley. You might just be one of the lucky ones to spot wild brumbies roaming the plains. Walk quietly in this special, pristine place. Finish the day with an easy stroll along the banks of the swift Thredbo River as it meanders down to the village. After breakfast, you’ll be transported back to Jindabyne where your trip finishes. The tracks are well graded except for one small section on Day 3, but all the tracks are still easy to negotiate. Full day walks average about 15km. There are great opportunities for really fit walkers to challenge themselves on just about all of the days. The ski lodge and hotel accommodations are very comfortable on this walk. All are in excellent locations and are right in the park for ample opportunity to explore. Every room has its own ensuite. The two course dinners are plentiful as are the cooked breakfasts. However, the Lodge at Smiggin Holes is not hosted, so your meals will be delivered by a local caterer. The Roof of Australia commences in Jindabyne, approximately halfway between Sydney and Melbourne. The easiest way to get to Jindabyne is to drive. There is a daily coach service from Canberra to Cooma – you would then need to catch a taxi from Cooma to Jindabyne. You can also fly from Sydney to Cooma on Aeropelican and catch a private transfer to Jindabyne. We can supply more detailed information on request. However, it is more convenient and often cheaper to hire a car and leave it in Jindabyne during this walking holiday. This walk is rated as moderate with ample opportunity to push yourself to make this more challenging with additional options offered. All tracks remain well-marked, but the alpine terrain is at times undulating. There are some rough tracks along long, gradual ascents to the summits, plus some steep uphill and downhill sections. This walking holiday starts and finishes in Jindabyne with transfers between accommodation and sections of the walk. Each walking day you’ll cover an average of just over 14km, but with the options we offer along the way that can be increased. As part of the walk you’ll even take an optional ride on a chairlift for part of the way. We move your luggage ahead to your next accommodation at each stage, so all you need to carry is what you need for the day. This walk can be done any time from the start of December to 20th April. This mountain environment is about 10–15 degrees cooler than Melbourne and Sydney, and there is a possibility of bad weather even during summer. January and February are usually warm and the alpine wildflowers are at their best. December and March are usually mild, and considered by many people to be the best times to visit. For nearly 30 years we have taken pride in providing seamlessly organised walking holidays, but we know, even with that in mind, that you’ll have many more questions. You will receive a very detailed information pack and itinerary approximately 6 weeks out from departure outlining all the fine details and much more.